Here are six incredible hot chocolate recipes (both boozy and booze-free) that will upgrade any snuggly situation. Picture this: You’re snuggled up under a plaid, cashmere blanket next to a fire (or Netflix). It just started to snow, there’s a sleepy golden retriever spooning your legs, and you're holding a giant mug of dark hot chocolate with more than a splash of rum. At Food & Wine, we call that a cozy scenario. This winter, use #cozyscenario on Instagram and we may spotlight yours! 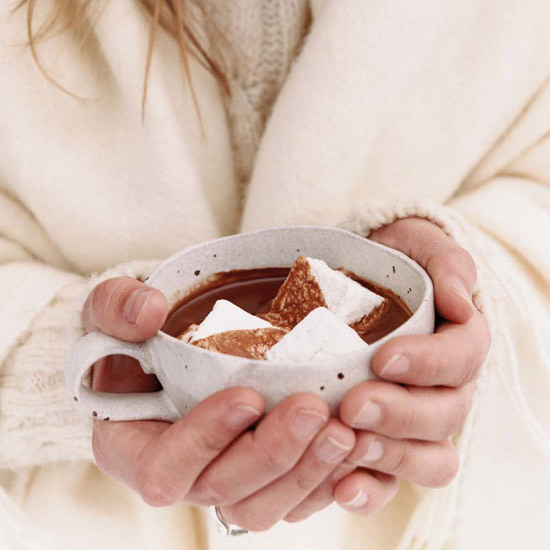 To kick things off, here are six incredible hot chocolate recipes (both boozy and booze-free) that will upgrade any snuggly situation. Dark rum is a terrific addition to creamy hot cocoa. This hot chocolate is so creamy and thick that it could be dessert. Inspired by the minty candy, this hot cocktail is made with white hot chocolate, rum, brandy and crème de menthe. Máchica is a sweetened, spiced grain blend that Ecuadorans use to enrich the texture and flavor of drinks. This super-indulgent hot cocoa is spiked with rum, maraschino liqueur and allspice liqueur. Chocolate and thick creamy coconut are an incredible match. Related: Best Hot Chocolate in the U.S.